I've been thinking about this for a while, and I gotta say -- I'm pretty much through with ten sided dice. I don't have any problem with dice that produce a 1-10 result, I just don't like the pointy little non-platonic bastards that keep stabbing me in the hand. Twenty siders, numbered from 0-9 twice. Found 'em on ebay. These are the style of dice you used to get back in the day, but made of modern materials (i.e. ; they won't start wearing away immediately). They just feel better. They probably don't roll any more randomly, but I don't care. I'm happy with them and that's what matters to me. And, in other news, Fight On! number 9 is out. But you knew that already, right? Thought so. Heh. I have a draft blog post on this very subject. I have a couple like those, but I ordered a bunch of Gamescience d20+ dice (20-siders numbered 0 to 9 and 0+ to 9+) just yesterday to match my newer sets that came with the 1 to 20 d20s. My problem is distinguishing quickly between the d8 and d10. Do they make a d16, or do still have to roll a d6 and d8 to get that range? Robert: Yeah, I wish I had known they still made 20+. I had one back in the 80s and loved it. But Zocchi's site confuses the heck out of me, I can't find anything on it. Paladin: Don't know if they still make a d16; can't say as I've ever seen one. But you could always just roll a d20 and reroll anything over 16. I have a couple of d16s. They are “true d10” style, so I tend to prefer the d8 & d6 workaround anyway. 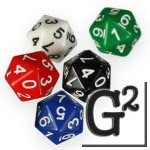 Gamescience is selling sets with d3, d5, d14, d16, and d24 in addition to the standards. Hard to justify the extra cost—more than double the price of a standard set. So, I probably won’t buy any more of them. I suspect they aren’t still making the d20+. I think they’re just “new old stock”. Yeah, the Gamescience site isn’t great. Gamestation—their primary online retailer—is better. Gamestation also sells through Amazon, though. Sometimes it can be easier to find what your looking for there. Yeah, Sunday night. I didn't have any use for them in your game, since we only used d20 and d6.